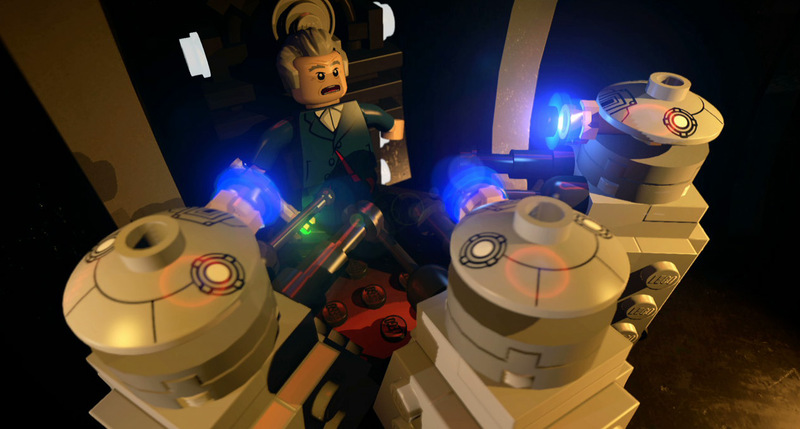 It’s day four of Lego Dimensions week on Tired Old Hack, and today we’re taking on the might of the Doctor Who level pack. Check out the reviews of the Simpsons, Back To The Future and Portal 2 level packs if you missed them, and come back tomorrow for the final review, the Ghostbusters level pack. 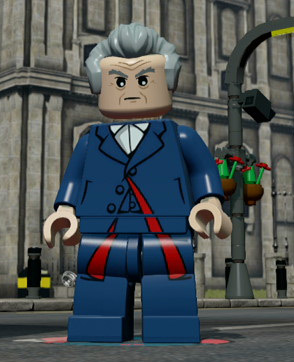 The presence of Doctor Who in Lego Dimensions is undoubtedly one of the most important pieces of business for the game. The BBC series remains immensely popular worldwide, and even though an official Lego TARDIS set was released just after this level pack was, it’s clear the Dimensions deal had been done a long time prior. Thankfully this level pack is a treat for fans: not just of the Twelfth Doctor but, as it turns out, the entire series’ history as a whole. The new stage you get with the Doctor Who level pack is called The Dalek Extermination Of Earth and plays out like an episode of the show, complete with an opening scene and title credits. It’s a simple enough story: Davros has sent a swarm of Daleks to invade Earth as a way of luring the Doctor into his trap, so it’s up to you to save the planet and give him a swift boot in the plums for being such a sod. Whereas this level follows a similar structure to the Simpsons, Back To The Future and Portal 2 level packs by splitting into numerous different areas, things are made a little more interesting here with the addition of a lovely little wibbly-wobbly timey-wimey mechanic. You see, though there are a seemingly underwhelming three sections in the Doctor Who level compared to four in the others, technically it’s actually five because the first London section can be accessed in three different time zones. You start off in London in 2025, with the city ablaze and loads of Daleks generally rolling around and wrecking stuff. There’s a massive forcefield here which you have to disable by cutting off its three power supplies, but that’s easier said than done because a lot of your paths are blocked off by various obstacles you cant bypass. To solve this, you travel back in time – first to London in 2015, then to Victorian London – to make changes to the landscape that have a subsequent effect in 2025. The best example of this is the massive chasm that’s been blasted into one of the roads in 2025. You can’t get over it and there’s a double decker bus wedged in it. You can’t climb the bus, so you have to travel back to 2015 and solve a puzzle to plant a tree nearby. Then, when you travel back to 2025, the tree’s grown and you can use its branches to get onto the bus and over the chasm. There are similar tricks dotted around the three time zones, giving this first section a unique feel you don’t get elsewhere in Lego Dimensions. Once you’re past this section, which takes up a good chunk of the level, you travel to Trenzalore to try to find the source of the invasion. There you’ll encounter both Weeping Angels and The Silence as you try to make your way through the stage. After this, it’s off to Skaro where you finally get to face off against Davros one-on-one. Well, if you don’t count all the Daleks he summons. This is a great level and one Doctor Who fans should be chuffed with. While the attempts at humour in the cutscenes fall uncharacteristically flat compared to the rest of the game, the level itself is still impressively detailed and the time-shifting puzzle is a nice change of pace. At first glance, Doctor is a neat little minifig. His design is based on the Twelfth Doctor as played by Peter Capaldi, and he comes with a Sonic Screwdriver. In-game, said screwdriver is his main tool: he can use it to fix broken contraptions, shatter glass, hack computers and interact with control panels. There aren’t many characters in the game with a skill set as wide as the Doctor’s, making him a really useful member to have in your roster. Or should I say ‘members’. You see, once you beat the included level for the first time, you unlock the Doctor’s ability to regenerate. Fantastically, this means all 13 incarnations of the Doctor are playable, with him regenerating into the next Doctor in the sequence each time he dies. The star of the show is still the Twelfth Doctor though, as made clear by the fact that Peter Capaldi recorded brand new dialogue for the game. Not only does this make the Doctor pleasingly chatty throughout the level, it also means he dishes out loads of unique, brilliantly sarcastic lines any time you put him next to another character. This extends to some of the other vehicles too. Put him in the Mystery Machine and he’ll state that the only ‘mystery’ is how it passed its MOT. And given the DeLorean’s inability to go beyond 88mph, let’s just say he isn’t shy about saying which time machine he prefers to use. You couldn’t have the Doctor without also having his trusty time machine, and the TARDIS is a lovely wee model to put together. Although at first glance you wouldn’t expect it to be capable of much it actually has a few interesting features. Not only can it fly – letting you travel wherever you like with ease – it also has a stealth mode which can be used to bypass lasers. 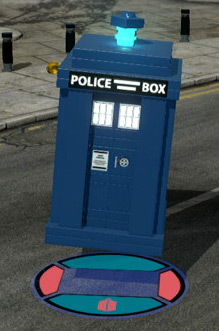 It can also land on unique TARDIS docks and transport you to other dimensions. While most of these can be found in the included level, there are docks in the two Simpsons levels – the Starter Pack one and the level pack one – that take you to the Flintstones’ and Jetsons’ homes respectively. The result is a fairly useful gadget that only properly comes into its own in the Doctor Who level and Adventure World. The Doctor’s other gadget is a pleasant surprise: beloved retro robot dog K-9, complete with authentically crap robot voice. And that’s a good thing. Believe it or not, K-9 is actually a bloody good vehicle. He’s surprisingly fast, almost as much as some cars, but with the added benefit of tighter control. He’s also got an effective gun that not only destroys silver Lego bricks but also has a quick fire rate, letting you cause carnage as you blast your way through enemies and scenery. A further upgrade to K-9 Laser Cutter does what it says on the tin, turning him into a makeshift laser turret which can destroy gold blocks and cut through gold walls. K-9 is a useful vehicle to have in your roster, especially if you use a character who can’t blow up silver or gold bricks or smash glass. His impressive speed and tight controls make quickly exploring areas a breeze, and his small size compared to other vehicles means there are far fewer awkward bumps. There’s a ridiculous level of detail in the Doctor Who level pack, meaning fans of the series will have a field day here. The fact that you’re not only getting one of the longest levels in the game (it should take around an hour to beat without going for collectibles) but also getting 13 playable characters with their own dialogue and personality is great stuff. 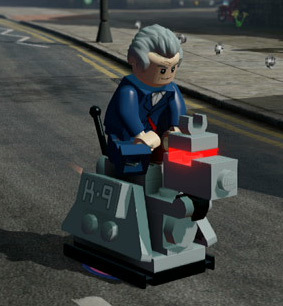 The TARDIS isn’t the most versatile gadget you’ll get in the game, but K-9 more than makes up for this, providing a fast vehicle with a wide range of abilities letting you destroy numerous types of special block. It’s also worth bearing in mind that this level pack also gives you access to the Doctor Who Adventure World, which offers another few hours of free-roaming gameplay. While there’s also a separate Cyberman figure you can buy to access the Adventure World, so much of it revolves around using the TARDIS that without it you can only access a fraction of it, meaning the only way to experience it fully is to get the Doctor Who level pack. Which, if you’re a Doctor Who fan, you really should. Not only is this a brilliant little package, given the rubbish fans have had to put up with over the years I suppose you could say it also counts as the first entertaining Doctor Who console ‘game’ (bite-sized though it may be). 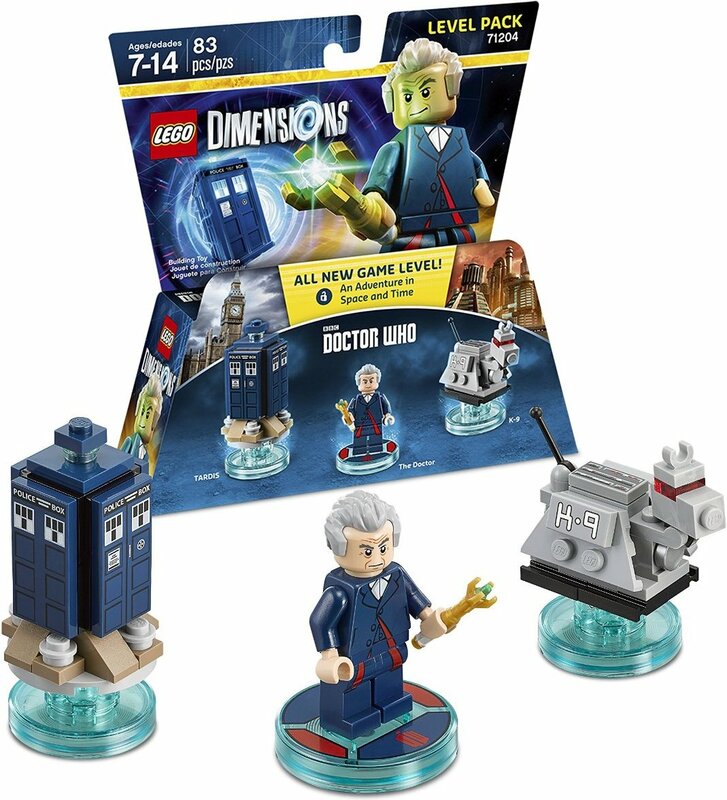 If you want to buy the Lego Dimensions Doctor Who Level Pack and fancy doing it through Amazon, please do it using this link: Amazon UK. It won’t cost you any extra and a cut of the profits will go to me, letting me invest back into improving the site. Once you beat the level, how can you get back to it to get to the minikits?